If you are an avid Facebook user and if you regularly use Facebook on some iOS or Android device, this is good news for you. 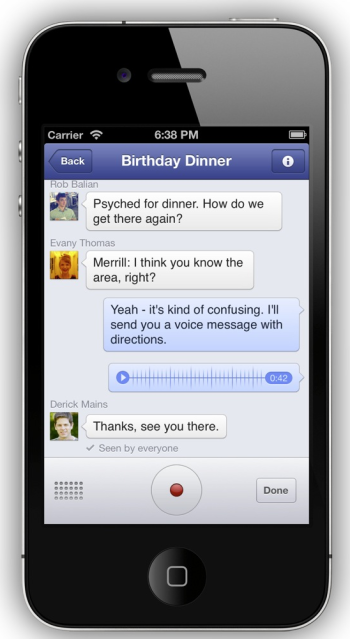 Facebook has recently released an update to its standalone messenger to iOS and Android apps. Now you can send up to one minute voice-message from this service. To send a voice message, you need to tap the + button beside where you traditionally type a message in the Messenger app. Then select Record, holding the button down to speak. When you release the Record button, your voice message will be sent to your recipient. This is good as many times, text messages cannot cover everything. Long text messages are difficult to type but speaking is easy. So voice messaging is definitely a boon. Now there is a possibility that in near future, Facebook might also add the feature of video messaging as well. Apart from update to voice messaging, Facebook has also released update to FACEVOIP, its service for Voice-Over Internet Protocol. The new VoIP test has not been built on Facebook‘s existing Skype partnership which powered a briefly available limited test of voice calling on Facebook‘s desktop website in January 2011. This indicates that the relations between Facebook and Skype‘s owner Microsoft, which also powers Bing search integration and display ads on Facebook, are not as good as we think. If the trend continues, Facebook might also rope in some other partner with search. Voice Messaging and VoIP could also be seen as Facebook‘s attempt to compete with the default calling app on smartphones. However, we want to remind you that VoIP might be free to use, but such calls will use your existing data plan, which could get pricey if you use the feature often. 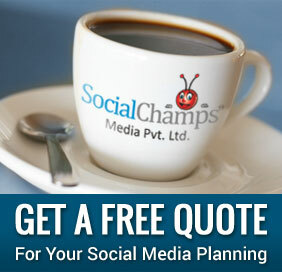 Like Google, Facebook is also entering various ventures and emerging as a key competitor in various markets. Let us see how the new competitors of Facebook face the challenge from a company that is usually known as a social media giant.